Receptors of Inflammatory Cells: Structure-Function Relationships is the first in a new serial on Cellular and Molecular Mechanisms of Inflammation. The purpose of this serial is to bring together the latest knowledge in various areas of research in this actively developing field around a topical focus. These volumes are not intended to present comprehensive reviews. Rather, each contribution is meant to be a status report from laboratories actively working in an area. This volume presents an analysis of the structure-function relationships of receptors. It is clear that the structure of receptors provides the initial guidance for numerous functions of each cell in the organism. Through an analysis of the submolecular features of the receptors that are responsible for the initiation of activity of diverse biochemical pathways within the cells, a molecular understanding of the all important initial, guiding events of cell functions will emerge. In the broad sense of cells involved in inflammation, this includes mitogenesis, gene transcription, generation of lipid metabolites and oxidants, clearance of molecules from the surrounding medium, and release of granular constituents from cytoplasmic vesicles into the external medium, among others. The contents of this first volume will serve as a foundation for the subject of the second volume, which is signal transduction. 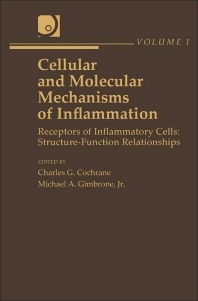 Four additional volumes are in preparation, including Endothelial Leukocyte-Adhesion Molecules, Leukocyte Adhesive Mechanisms in Inflammation and Immunity, a second volume on Signal Transduction, and Stimulation of Inflammatory Cells. Chapter 5 Influenza A Virus Activation of the Human Neutrophil: A Case of Promiscuous Binding?